Virginia’s most famous college town is probably Charlottesville. Home to the University of Virginia (UVA), active adults move to the city and surrounding area to enjoy the amenities of a city with beautiful landscape. While the cost of living in the city of Charlottesville is slightly higher than the national average, Albermarle and surrounding counties are lower. Although the university drives down the median age of the area to about 25, about 15% of the population is over 55. Here’s what active adults can expect from the region. The Downtown Mall in Charlottesville is the center of action in the city. With a population of almost 40,000 and diversity from the students and faculty at UVA, the city has a lot of offer. Residents can enjoy a variety of cuisines at restaurants while art lovers can walk around the city and experience art galleries, music venues, and museums. Special events in the city include the Virginia Film Festival, Virginia Festival of the Book, and the Charlottesville Opera’s Summer Outdoor Season. For those who enjoy sports, UVA football and basketball games bring the whole community together. Scenic Shenandoah Valley offers residents plenty of opportunities for outdoor adventure. Surrounding Charlottesville is the picturesque Shenandoah Valley. The region offers history, outdoors activities, and some of the best wine in the Mid-Atlantic. Many people know Charlottesville because of Monticello, President Thomas Jefferson’s Virginia home. The restored Colonial mansion explores the life of the Jeffersons and the enslaved who worked on the plantation. Along Route 29, active adults will find great places for day excursions. North towards Ruckersville, antique shops and quaint galleries line the road. The Shenandoah Valley Wine Trail extends from Northern Virginia to past Charlottesville and highlights over 20 small wineries in the region. Charlottesville is also called the gateway to the Blue Ridge. 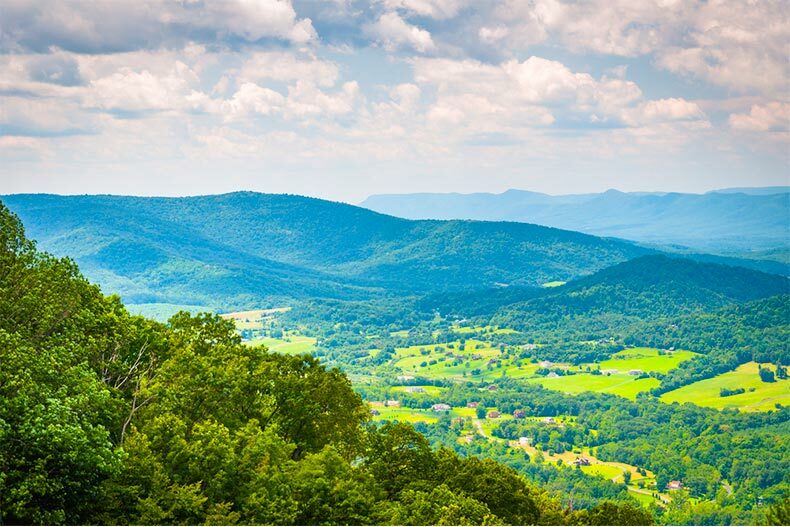 Within a short drive from the city, active adults who enjoy the outdoors can hike in the Shenandoah National Park, canoe or kayak the Shenandoah River, and ski or bike (depending on the season) at the Wintergreen Resort. Here are three active adult communities in the Charlottesville area. University Village allows active adults to live near the heart of Charlottesville with maintenance-free living. 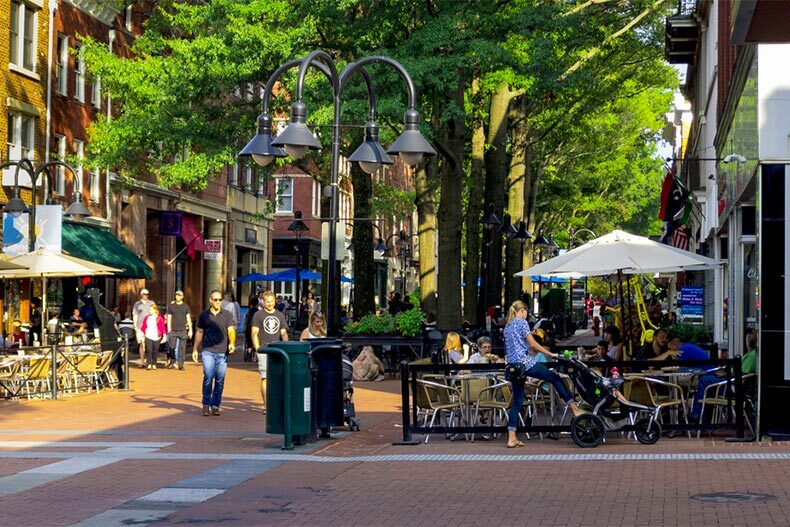 With the downtown mall only 15 minutes away, residents can easily enjoy the dining, arts, and culture of Charlottesville. And when not visiting the city, residents can swim in the indoor pool, exercise at the fitness center, or enjoy time with neighbors in the meeting and craft rooms. The 94 condo units were built between 1990 and 1994, and are currently offered for resale. The two-bed, two-bath homes range from 923 to 1,547 square feet, and all include indoor parking. Four Seasons at Charlottesville in Ruckersville offers active adults resort-style living just thirty minutes north of the city center. Builder K. Hovnanian constructed the small community of 144 homes between 2005 and 2010. Homes are now offered for resale. The grand 23,000 square-foot clubhouse includes a library, meeting rooms, a coffee shop, card room, billiards room, and learning center. Adults can stay active with group classes, or swimming in the pool, exercising in the fitness center, or walking the scenic trails around the community. The Villages at Nahor is a rural 55+ community located half an hour southeast of Charlottesville. Prospective homebuyers can choose homes that have already been built, or customize a dream retirement home. The single-family and attached homes range from 1,400 to 2,460 square feet and have two to four bedrooms. The area offers ample opportunity to be outdoors while the community itself has a clubhouse with exercise room and meeting rooms as well as an outdoor pool.